Light and cool in natural cotton, these stylish ladies Elle Sport Non-Cushioned Anklet Socks will make sure you stay fresh, with a pique mesh construction upper that lets air circulate. This twin pack of contrasting colour ankle socks are made with neat crew-style ribbed elasticated legs, topped by Elle logo cuffs. and with hand linked toes for smooth seams that care for your feet and lessen the chances of blisters. 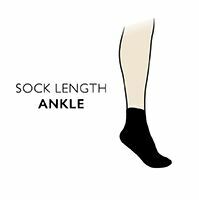 The smooth, cotton rich weave and non-cushioned design of Elle Sport Non-Cushioned Anklets is great for trainers and plimsolls that need a more perfect fit.